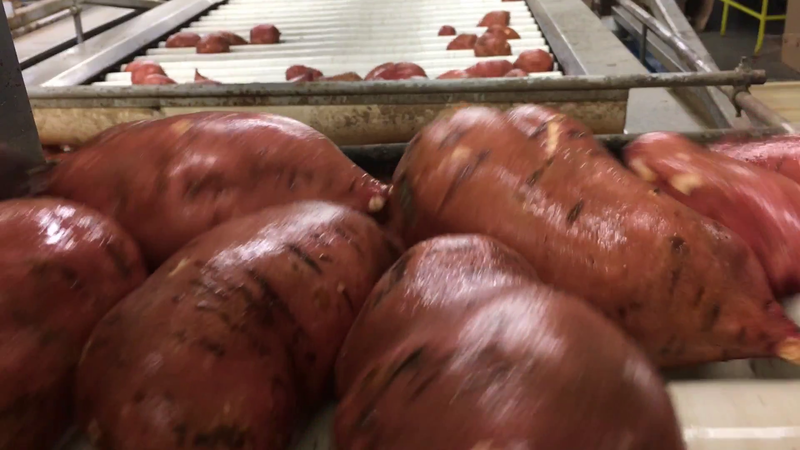 Click the play button above to watch a video on Wilson County sweet potato production recorded by Times journalist Drew C. Wilson. White potatoes and sweet potatoes both grow in the ground, but that’s about where the similarities end. “There’s nothing similar about sweet potatoes and white potatoes,” said Robert Boyette, co-owner of Boyette Brothers Produce LLC with Michael and Wiley Boyette. The company sold about 23 million pounds of sweet potatoes in 2016. The cost of sweet potato production is very high. Boyette said sweet potatoes can’t be grown, produced and sold at the same price level as white potatoes. Sweet potatoes earned more than $44.3 million in Wilson County in 2016, which was more than tobacco at $37 million. “The soil that you grow tobacco on, you can grow sweet potatoes. It’s very conducive. They are compaiable,” Boyette said. According to Boyette, since the 1960s there have been a lot of sweet potatoes grown in this area. Many tobacco farmers started growing sweet potatoes as a supplement to their other farm income. The two crops use much of the same equipment. “Most of the tobacco farmers, when we had the contracts cut or reduced, they were looking to supplement that income. They’ve already got the transplanters and they have already got the cultivators and they got the land,” Boyette said. “We started out with 100 acres in 1982,” Boyette said. In 2017, the farm committed 1,150 acres to sweet potatoes. The company added a 250,000-bushel storage facility in 2011. In 2012, it added another building that today serves as the packing house that Boyette manages. Boyette Brothers Produce employs between 40 and 50 people in the packing house. They are mostly workers from Mexico on H-2A temporary worker visas. The company has really ramped up production after getting out of tobacco. “It’s been a good move for us,” Boyette said. Boyette Brothers Produce ships sweet potatoes to the United Kingdom, Ireland, France and Holland. Marketing conditions for the last year have not been all that great, though. The demand for sweet potatoes continues to rise from frozen french fries to fresh market, but for a couple years, demand has not grown as fast as the supply. Boyette said the sweet potato market is basically local-based. “The North Carolina Sweet Potato Commission has done a good job of promoting North Carolina sweet potatoes all over the world,” Boyette said. Boyette Brothers Produce is committed to staying in the sweet potato business. “I think sweet potato production is here to stay,” Boyette said. Wilson County sweet potatoes started to be harvested about two weeks ago. According to Tommy Batts, of the North Carolina Cooperative Extension office in Wilson County, the county is actually down in sweet potato acreage. In 2016, Wilson County had about 10,400 acres harvested, and in 2017, there are 9,800 acres planted. Boyette Brothers Farms is one of six sweet potato packing houses in Wilson County. North Carolina had 95,000 acres in 2016 and this year ,a June projection counted 82,000 acres planted.